First produced in Maryland in the 1890s, the brand, along with the rest of the once-booming Maryland Rye industry, was shuttered by prohibition. The brand reemerged after prohibition and became the last standing Maryland Rye, as the rest of the industry’s production had ceased. Now produced in Kentucky from extra-aged barrels stored in prime warehouse locations, Heaven Hill keeps this historic Maryland mark alive with this award-winning six year old, 110 proof offering. Product will roll out to limited states this summer but will go national in the Fall at a suggested retail price of $49.99. Limpd: Astringent at first. Once I get past that, there are hints of menthol, honeysuckle, vanilla, and powdered sugar. Limpd: Crisp and sweet upfront. A little vapory and then a lot of heat in the middle. The finish is warm and relatively short. G-LO: The mouthfeel is a touch on the thin and watery side. Starts off slow and then heats up quickly with cracked pepper and cinnamon heat. There’s a healthy dose of sweetness in the background, i.e. caramel and burnt sugar along with some clove. The finish is warm and lingering with lots of spice sweetness. A touch of bitterness comes through in the aftertaste, but not in an overbearing way. Limpd: This is not a typical Rye, i.e. it doesn’t have that sharp note that I usually experience whenever I drink the stuff. Rather, this one is more well rounded with a greater depth of flavor. I’m guessing that it has a lot to do with the higher proof and extra time spent in the barrel. Me likey! G-LO: Well this was quite a pleasant surprise. Much like the Crown Royal Northern Harvest Rye, this was different from the usual suspects that we get from Indiana. I like that bit of sweetness and I love the higher octane. I would definitely pick up a bottle of this stuff. 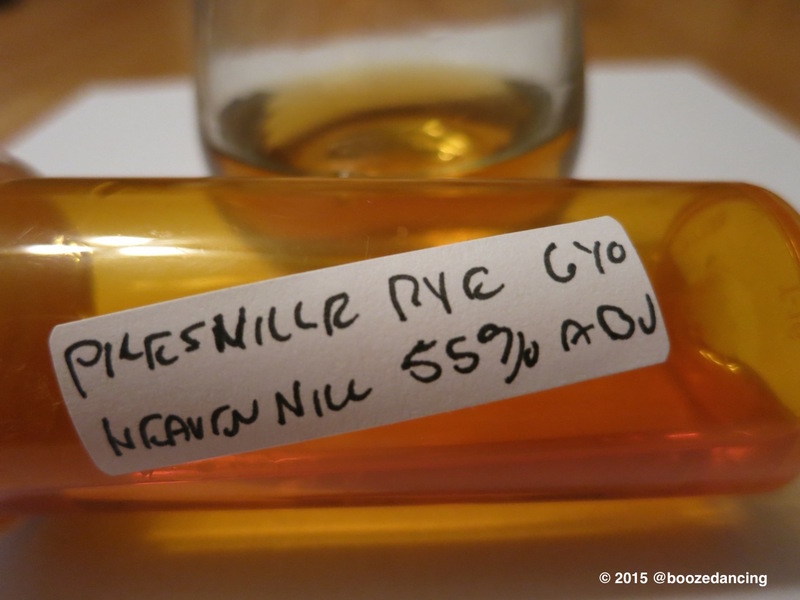 Once again, many thanks to Mark Gillespie of WhiskyCast for supplying us with this tasty sample! How could I insult your physique? A bit of a pot & kettle thing. I say you darken my doorstep in an effort to push the drinking off on you. Yes, that’s right kids. Bad Mr. G-LO just showed up & made me drink. He’s bad, bad man! Your kids are smart. I really am.